As we age, oxygen levels in the skin decrease resulting in poor cell functionality and the formation of lines and wrinkles. Oxygen Therapy replenishes lost oxygen & revitalises the skin, visibly plumping out these lines and wrinkles. The results are immediate, hailing this treatment as a ‘pre red carpet’ must amongst celebrities, but an Oxygen facial also continues to work long after the treatment, stimulating cell regeneration. 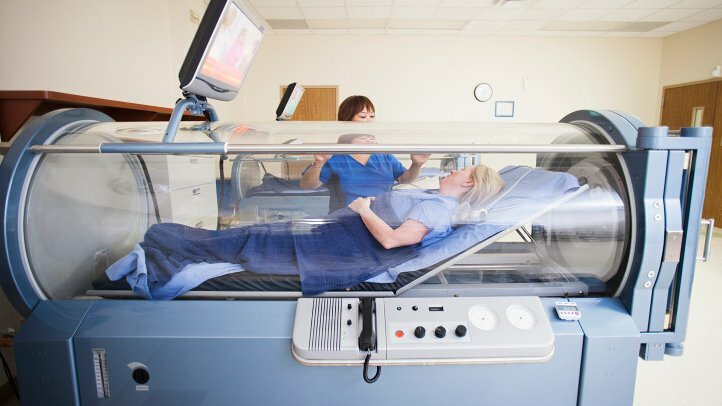 During the treatment, pressurised or hyperbaric oxygen is swept over the skin with a wand providing a cooling effect and also penetrating concentrated, concern specific topicals deep within the skin. The benefits are countless – It rehydrates and rejuvenates skin, increases micro circulation, helps skin recover from sun damage, has a ’plump up’ effect giving an instant lift and glow, diminishes expression lines and deep eye contours instantly, evens skin tone providing a brighter complexion and defines eye contour and overall skin clarity.